J. P. Ault: A Scientist at Sea highlights the life and work of James Percy Ault (1881-1929) through his correspondence, photographs, and writings. A geophysicist and explorer, Ault traversed the globe in the early 1900s on research expeditions for the Carnegie Institution's Department of Terrestrial Magnetism. 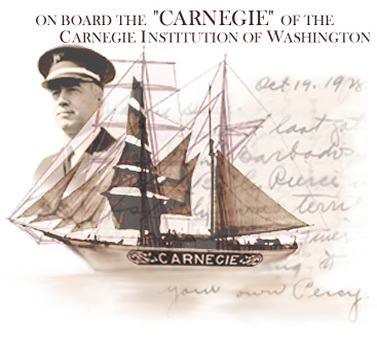 He commanded the research vessel Carnegie for many years and died tragically with the destruction of the ship. Captain Ault and his wife Mamie were prolific correpondents. In 1997, a trove of more than two thousand of their letters written between 1904 and 1929 were donated to the Department's archives by Ault's grandson, Peter Tinsley. Together with Ault material already held by the archives, the J. P. Ault Papers provide a window on life and research at sea during the early 20th Century and on the workings of the Carnegie Institution. They also reflect a devoted husband and father, and a man described by a colleague as having "exalted ideals and sterling character ... a charming personality ... and a spirit of sympathetic congeniality which won for him the highest esteem and enduring friendship of all whose privilege it was to work with him."